I’m in Tampa, Florida, for the annual Vision Sciences Society (VSS) meeting. I brought one of my pet projects with me. Performance discontinuities have been used in a sort-of-informally-eye-balling-graphs way to estimate working memory capacity. Some of this is cited by Cowan (2000) as evidence for a “magical” capacity of four chunks in working memory. 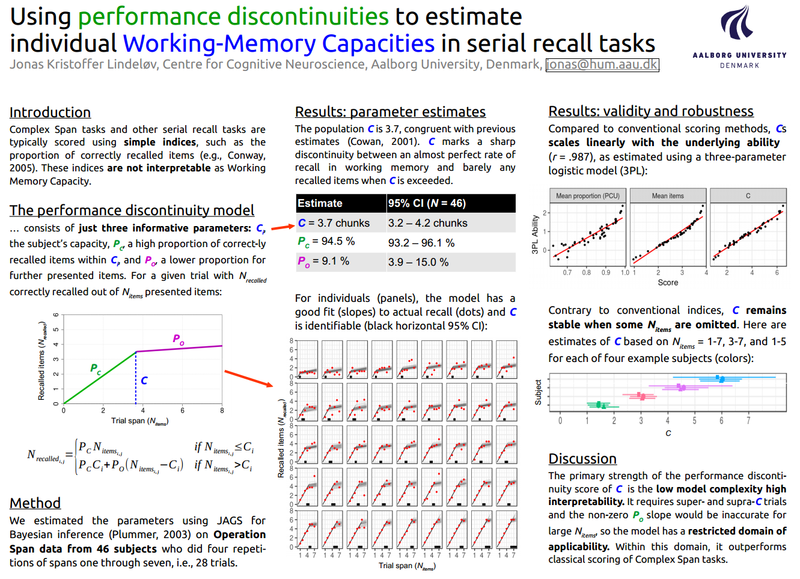 I try to formalise the estimate of working memory capacity from performance discontinuities using a Bayesian analysis. In brief, I think that most of the current scores on serial recall tasks are either hard to interpret theoretically or very complex. Existing packages to estimate discontinuities (switch point analysis, change point, regression discontinuity, etc.) either estimate changes in offsets (not slopes) or do not provide a posterior distribution of the point of discontinuity. I’m currently writing up a more detailed paper on this, accompanied by an R notebook and a small R package to do the analysis. Here is the poster PDF. SPSS is dying. It’s time to change.